In case you hadn’t heard – we’ve moved to Chicago! Long story short, last spring we left our beloved city of Austin and came to Chicago (where I’m originally from). Our original plan was to stay in Chicago temporarily for the summer and definitely(!) leave before the winter. Well, as you see, that didn’t really happen because here we are. I’ll spare you the details, but we spent about 7 months this past year jumping between airbnb’s, hotels, friends’ houses, and parent’s houses (with a marble slab in our car’s trunk to continue shooting recipes). After all of that, we are SO happy to finally be settling into our new home in the windy city. Here’s a sneak peek of the new kitchen! What I love about it is that it evokes the style of our Austin kitchen without being a clone of it. 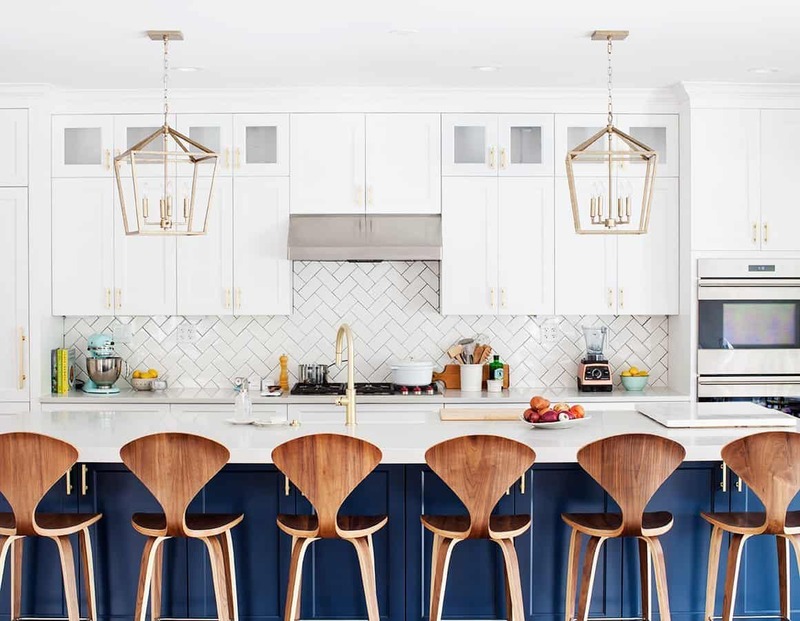 I will always love subway tiles, white cabinets, and marble (although the new counter-tops are quartz that look like marble), but here I love the pop of the dark blue and and the brushed brass details. I’m also so smitten over these curvy wooden Norman Counter Stools from Rove Concepts. Choosing counter stools is difficult because they’re such a focal point in the kitchen. I absolutely love the way these look here. They’re also super comfortable to sit in, which is important to me. Rove Concepts SO kindly sent them to us and they’re also offering a giveaway to our readers – see the bottom of the post for details! On the other side of the kitchen, we have this cute breakfast nook. We thought about doing a built in bench/banquette sort of seating but I really wanted a round table to contrast the strong lines of the kitchen island. I had this Carrara Tulip Table in my mind from the get go – it’s a 100% marble top (it weighs a ton!) and I love it because we can do some of our photography in this area. It’s also a cozy nook to have breakfast in, hence its name: the breakfast nook. Rove Concepts is giving away a $250 credit to one lucky reader – if you win, you get to use the credit toward anything you want from their store! Their furniture and home decor items are so so lovely! To enter, follow Rove Concepts on Instagram, then go to roveconcepts.com and come back here to leave a comment below telling us your favorite product. This giveaway will end November 6th and is open only to U.S. and Canadian readers. I wish for the Vodder Dresser! So where am I suppose to leave my comment about the $250 drawing???? I need those barstools. From Rove: Farmhouse Glass Pendant! Beautiful, simple, clean lighting—perfect over a kitchen island! Congratulations on your new home; may you have years of joy in Chicago! The Carrara Tulip Table is exactly what I am looking for! And it’s actually for my new home in Chicago too! Thanks for sharing Rove Concepts. Just checked out their beautiful furniture. I’m totally in love with The Round Chair and the barstools you featured! Hi Maggie, we really really loved Austin, we had been there for over 10 years and felt like we were ready for a change. But I was also having some health issues due to allergies. My family is in the Chicago area so it made sense to settle here. Hope that helps! I’m happy to go into more depth if you want to email me. What a beautiful kitchen! Rove Concepts makes such beautiful furniture and accessories. I really love the Lasse coffee and side tables – so simple and modern. Love your new kitchen. Especially love the bar stools … they’re my favorite Rove piece as well. That new kitchen is gorgeous! The barstools are beautiful, but I actually think the tulip table is my favorite! I also really loved the Sophia sofa on their website. The Flag Halyard Chair is my favorite. I haven’t seen anything else like it. I’m very fond of unusual, yet stylish, statement-making pieces. Don’t make me pick. Lots of lovely pieces, the Lars Dinging Table, the Noah Sofa, the Pastoe Sideboard…. Your kitchen looks amazing. My husband and I moved from Austin to Chicago over 4 years ago and love living in the city. Wonderful pieces from Rove Concepts and I would pick the Eileen Gray Adjustable Table. Welcome Home ! In more ways than one ! Love the kitchen ! And Nook ! was in Chgo when we were first starting out……love the lines! I love the ceramic and wood bowls 🙂 congrats on your beautiful new kitchen! Your kitchen is beyond! I can’t wait for more incredible recipes! I have never made a recipe from you that I have not absolutely loved! Rove concepts has some great items! I love the Jette shelf ladder and the Mouille floor lamp! Love your kitchen- obsessed with the color palette and breakfast nook! And I similarly adore the Anders dining chair over at Rove. I love this kitchen! We just purchased our first new home and are looking for the perfect furniture! I love the 1955 sideboard from Rove, our record player would look so co sitting on top of it! Love your kitchen! I’d love to hear more about your counter and see close-up pictures. I also love the Womb Chair at Rove. 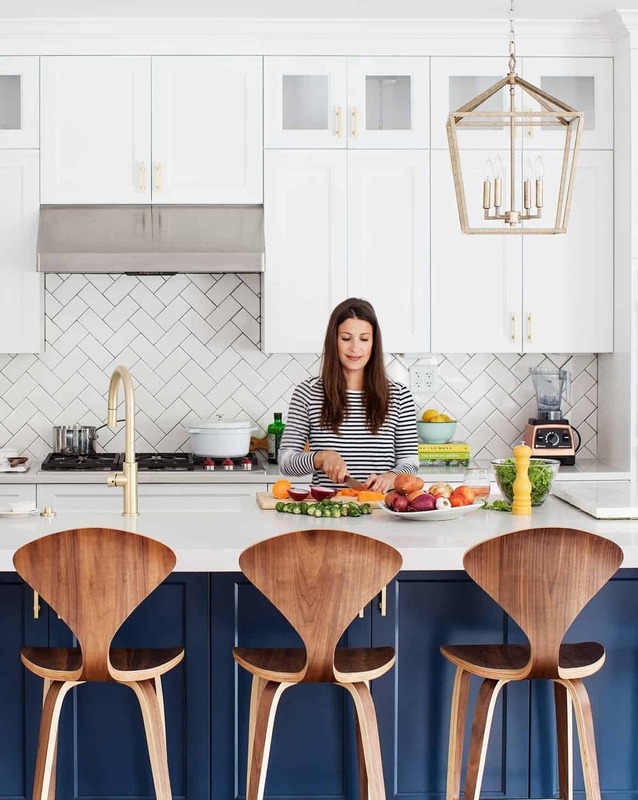 Obsessed with your kitchen AND the round Tulip Table! I LOVE that pop of color on the island plus the stools plus the pendants plus pretty much everything else. ATX is such an awesome city, so I know that must have been so tough to leave. Chicago will treat you well though! Your kitchen is beautiful ~ it must truly feel like “home” now because there is nothing more important than family. I love the Sebastian Rug in Chestnut! who is the light by in the nook area? Ooh, same question from me! That light fixture is so beautiful! Your new kitchen is dream! I absolutely love the color palette. We just moved into a new house recently and I have been eyeing Rove’s Hunter Bed among other pieces so this post is a pleasant surprise! I’ve pinned, saved and dreamed about that very Tulip Table! If my dining room was only so lucky I’d put that Rove Concepts credit to great use! Love Love Love the Norman Barstool!!! Must have 6 for my new kitchen remodel in Paso Robles, Ca. Asher bed and Luca sectional sofa! We’re looking for some new chairs for our living room and the Model 45 Easy Chair is soooo beautiful!!! Ugh why would you make me choose… Everything is so lovely at Rove. As a designer I’m a sucker for the classics. Gonna have to go with the Tulip Table Round – Carrara. Just bought some accents from Rove Concepts!! wishing for that store credit to put towards my dream reading chair – the Flag Halyard Chair. Jeanine this looks gorgeous! Did you build the whole kitchen from scratch or was some of it already there? We’re getting a kitchen island installed this weekend I can’t wait. I love the Rove Gustav Chair, as well as your bar stools. Beautiful kitchen, btw! The Evelyn Dining Table… so stunning. What a beautiful kitchen you have! They have a lot of fun pieces on their site, but I’ll say that the Vodder Night Stand caught my eye, since I’ve been on the lookout for a good night stand. I discovered Rove a couple of months ago. I love their furniture. The barstools look beautiful in your new home. I have my eyes on their Gustav lounge chair and ottamon. It feels like I’m copying you to say I want those barstools, but — I want those barstools! Gorgeous kitchen. I like the Norman bar stools the best. I’m all about the Asher TV Stand! The Porter Sectional looks SO comfy!! would look amazing in my living room! That Dolf coffee table would fit perfectly in our living room. Minimal but not cold. Beautiful kitchen and congrats on finding the perfect counter stool! We just finished a kitchen reno and the Jesper stools would be perfect in the new space! I also love that Rove cararra tulip table, it pairs beautifully with the cabinet behind it. Where is that cabinet from??? I follow them on instagram as @sweetums82. Welcome to Chicago!! Your kitchen is gorgeous, I love Rove Concepts. Their accessories are really nice and I adored your marble Tulip Table~ how stunning! More power to ya! Me, I’m a big “Cottage Home” dudette. My husband built us 2 beautiful homes, 1 acre on each. Lots of room to make wonserful gardens. AAAHHHH! Life is good! I’ve never heard of Rove before. I like their Executive Chair. Wish they made the style as a bar stool. I loveeee your new kitchen! The navy blue is such a perfect contrast to all of the white and the Rove bar chairs are perfect. Thanks for featuring Rove! Their products are beautiful and I love their sustainability commitment. I love both the Jonas and the Evelyn dining tables! Such clean lines and beautiful surfaces. Could you share what type of quartz you picked? I am currently trying to choose a countertop and I can’t find a white quartz that looks like real marble. The sample I have now looks more like varicose veins than marble. Love those Norman counter stools!! Would love them for my newly renovated kitchen!!! I’ve been lusting for months and months over the Rove pavilion bench to use at the end of our bed. So beautiful!!! The nordic floor lamp caught my eye the best! I also love the pendant lights in your kitchen! HI I love the color of your island. I have been thinking of painting mine a color other than white. I also like that brass seems to be making a comeback. I checked out Rove Concepts online and on Instagram and really fell in love with the Luca Sectional in that Vintage Velvet Solstice. I just love that teal color, and i am mad for velvet! Thanks for a great blog! What a great giveaway, and the new kitchen looks amazing! I love their ceramic and wood bowls. Thank you for this wonderful giveaway. I love those bar stools too!!! My favorite product is the Lucas sideboard and tulip coffee table! I love your blue island (my island is navy blue as well but with butcher block)! We will need new stools for our kitchen soon, as we are building an island. I like the Buch counter stool. I love the Womb Chair. It looks both cool and comfortable. The Mikkel bed is Bea-u-ti-ful! Oooh, lusting after a Florence sofa. And your counter stools! I love the Chloe bed! I’m obsessed with the Noah sectional. Obsessed. Have had my eye on the Carrara oval table for a while. Awaiting our kitchen model to be complete!! It’s hard to pick a favorite, but I cannot stop staring at the circle chair! Love these bar stools, need them in my new kitchen! Love those Norman counter stools! I think that stool is my favorite piece on their website. My favorite piece from Rove Concepts is the Lasse Side Table!! Beautiful! I’ve got major heart eyes for their dining tables. I adore your Norman barstools (they would be a fabulous addition to our basement) – but also love the Florence bench! That Asher Bed is gorgeous! What a beautiful collection. The asher bed is nice! Love the “Lantern table light” – so pretty! Hope you’re settling into your new place well. What a beautiful kitchen! Everything on the site is beautiful. I love the Jasper dining chairs. Clean lines and love the grey. I love the butterfly stool. I always read your blog, it inspires me to cook healthier meals. I’ve checked Rove Concepts and I like Cyclone Dining Table – it has a rad design and very unique. We’re in desperate need of new counter stools, and the DSW Counter Stool is right up our alley. Rove has such amazing pieces. I am also doing a kitchen renovation and have been eyeing the Rove Concepts Norman Counter Stools! This post is so inspirational – it’s everything we have been thinking about for our kitchen. So great to see it come together so nicely! It looks beautiful! And, this contest is so serendipitous! Crossing all my fingers and toes that I win! I also have to ask (if you can share), what is the source for your cabinet hardware? It is also beautiful! Obsessed with the Sophia Sectional! the Hunter bed…I’m in love. Love your blog & your recipes! We miss you in Austin!! I’m obsessed with the tulip table! I wish it came in a bigger size! I would love the same tulip table, but the side table version! My family is in the process of relocating too! The Dolf Coffee Table and Concrete Modern Pendant would definitely help our new open concept space come together! Lovely kitchen you have there in Chicago! I’m in desperate need of a dining table, and I love the Bennett!! I love the Luca armchair! That would be perfect in our living room. The Arc Floorlamp in black – so beautiful!! Awesome kitchen! Welcome back to Chicago! What great furniture at , love the PK31 Armchair in brown leather! My wife and I have been looking for an accent chair, this would be my pick! I like the Marcus dining table! Love the blues and brass in your new kitchen! We just managed to buy our first house after many long years of renting and I have been always dreaming about a Womb Chair and Ottoman that Rove has as part of their collection! Thanks for sharing your story and for the contest opportunity!! Love you kitchen! It’s gorgeous! I love the CH25 lounge chair. It’s perfect for my modern beach cottage style. I love the barstools. I would need 4 so $250 would help me quite a bit. I need a new table! The Winston Dining Table is beautiful. I want those fabulous Norman Counter Stools for my in progress kitchen renovation! Fabulous. Ooh! Your kitchen is beautiful and I love the tulip table you used. I might get that or the Bennett Dining Table. Thanks for the chance to win! I love the Porter Sectional! Your new kitchen is gorg’! I’m a huge fan of those kitchen stools you featured, plus I’m kind of in love with their plant baskets! I love the new line of tables and chairs from Sandro! followed on insta! i love the asher bed! Stumbled across your blog via Cottage and Vine! I love Austin and lived there twice but the Cedar is a killer! I have also discovered Chicago and love it! I always say the first four letters are “Chic” ! I think I need the Rove wishbone chairs to go with my Rove oval tulip table I bought when we remodeled our current home! I love the dining tables, especially karel and also the Jude table lamps, they are so pretty and slim and lovely shaped! I love the Luca sofa! Those stools you have are incredible too though! I would get the Rove Norman counter stools. I’ve thought about them for months but your kitchen has really confirmed it for me! I love the Norman counter stools 😊 but everything is beautiful! Beautiful kitchen! I LOVE the Luca sofa! I love all the colors! The Karla Display Unit is beautiful! Woh! it very beautyful! i want it! Beautiful! Would you mind sharing which quartz you picked and where your faucet is from? I am in fact Thankful to the owner of this site who has shared this impressive recipe.